On 19 November 2012 in The Hague, the International Court of Justice (ICJ) handed down its Judgement in the case between Nicaragua and Colombia concerning the two States’ dispute over territory and maritime jurisdiction in the south-western region of the Caribbean. The following day, Claire O’Neill McCleskey posted an article on the InSightCrime website in which she raised the possibility that the Court’s decision would have negative consequences in relation to the combating of serious crime in the region. What was it about the case that prompted this immediate reaction – and was that reaction justified? Indeed, are there any international criminal law consequences of the Judgement? The aim of this note is to provide a brief account of the case, its background and the manner in which the Court dealt with it, and to follow that up with some comment on whether or not there are likely to be significant consequences in relation to international crime and criminal law. The case was initiated by Nicaragua in December 2001. Seventy-three years earlier, the 1928 Barcenas-Esguerra Treaty had dealt with issues of sovereignty of islands in the region and for some time after that there was no obvious dispute between the two States. There were certainly no maritime boundary issues because, in 1928, the only cause for such would have been a dispute over overlapping claims to three nautical mile territorial seas; the islands were so far offshore (over 100 nautical miles) that this was simply not an issue – or regarded as potentially so. On the basis of its interpretation of the 1928 treaty, Colombia exercised sovereignty over several islands that were in very much closer proximity to the Nicaraguan coast than they were to Colombia’s. Three island groups in particular – San Andres, Providencia and Santa Catalina – were habitable islands that were expressly dealt with in the 1928 treaty. Today they are important tourist destinations in the region. San Andres (pop: 70,000) is just over 100 nautical miles from the Nicaraguan coast, while Providencia (pop: 5,000) and Santa Catalina are about 50 nautical miles to the north east of San Andres and about 125 nautical miles from the Nicaraguan coast. All three islands are in the region of 380 nautical miles from the Colombian coast. Two other physical features located to the north of San Andres, Providencia and Santa Catalina – Quitasueňo and Serrana – are very low lying, uninhabited banks or cays that were not expressly covered by the provisions of the 1928 treaty but which Colombia has always since then regarded as its territory. There was, though, some doubt as to the extent to which Quitasueno remained dry at high tide, a factor that the Court was required to consider. If it remained above sea level at high tide, it would be classed as an island and would generate a territorial sea – although almost certainly not an EEZ, as to do so it would need to be able to sustain human habitation or economic life under Article 121(3) of the 1982 United Nations Convention on the Law of the Sea (1982 UNCLOS). If it was submerged at high tide it would not qualify for island status, would not be appropriable as sovereign territory, and could not, therefore, generate a territorial sea or any other jurisdictional zone. At the time the 1928 treaty was negotiated, the potential for substantial resource exploitation in the waters between the two States had not been a consideration and had not influenced the terms of the treaty. The islands claimed by Colombia generated a three mile territorial sea but Colombian sovereignty over them had relatively little geo-political, legal or, indeed, economic, impact on the region. As the resources of the continental shelf emerged as a significant factor shaping the law of the sea in the second half of the twentieth century, however, the terms of the 1928 treaty increasingly came to be seen by Nicaragua as disadvantageous. Colombian sovereignty over the islands would have substantial impact as newly extended coastal state jurisdiction was established. The location of the islands had the potential greatly to restrict the extent of Nicaraguan continental shelf and exclusive economic claims while at the same time giving Colombia a disproportionately large area of jurisdiction. Nicaragua came to regard the situation as inequitable in the new era of extended jurisdiction and maritime resource exploitation, especially given the fact that the islands at the heart of the dispute were three times as distant from the Colombian mainland as they were from the Nicaraguan. The latter began to challenge Colombian sovereignty of the islands. The result was that the claims of both States to continental shelf and exclusive economic jurisdiction overlapped significantly and the dispute intensified as the potential for economic exploitation increased. In very general terms, this is the historical background to the dispute (more detail can be found in the Court’s Judgement and in the papers presented by both sides during the case.) Nicaragua took the case to the ICJ confident that the Court would award it sovereignty over key islands. It then expected the Court to define a maritime boundary using Nicaraguan sovereignty of the islands to establish its continental shelf and exclusive economic zone (EEZ) in substantial areas previously claimed by Colombia. Colombia, on the other hand, while reluctant to place the dispute with the Court, was anticipating a rejection of Nicaraguan claims for sovereignty over the islands, which it assumed would leave the Colombian claimed continental shelf and EEZ largely intact. The Court took seventeen days short of eleven years to reach its Judgement. One might ask why it took so long. 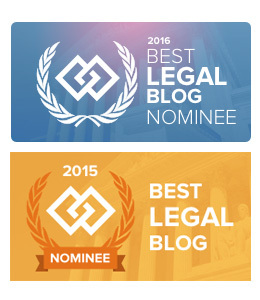 The answer lies in a combination of procedural requirements, the need for the Court initially to consider its own jurisdiction before moving on to the merits of the dispute itself, and technical complexities. Following Nicaragua’s filing of its Application in 2001, there followed the usual promulgation by the Court of deadlines for the submission of the Nicaraguan Memorial and the Colombian Counter-Memorial; these were set for April and June 2003 respectively. In July 2003, however, Colombia raised preliminary objections as to the Court’s jurisdiction and the proceedings on the merits were duly suspended. Public hearings on the preliminary objections were held in June 2007 and the Court handed down its judgement on these in December that year. With one important exception (see below), it concluded that it did have jurisdiction to adjudicate on the dispute. Colombia was then given a new deadline of 11 November 2008 to submit its Counter-Memorial on the merits. This was met and there followed a further round of deadlines for a Nicaraguan Reply (18 September 2009) and a Colombian Rejoinder (18 June 2010). Public hearings on the merits were eventually held between 23 April and 4 May 2012, with the Judgement handed down six months later. Maritime boundary disputes are frequently complicated by technical factors and this was certainly true in this case, in which hydrographic evidence concerning maritime features and tidal effects was submitted to the Court by both parties. Their representatives in the proceedings included both legal counsel and scientific and technical advisers, and each party challenged the other’s scientific and technical methodologies in the process. The principal technical issues in focus in relation to the question of sovereignty were to do with whether or not certain physical features qualified as islands or cays, or were merely raised banks that only dried at some point below high tide. The precise physical characteristics of the features and of the tides that affected them were important in determining whether or not it was possible for either State to claim them as territory and whether they would then, as a consequence, generate extensions of coastal state jurisdiction (territorial jurisdiction, exclusive economic jurisdiction, or jurisdiction over the continental shelf). Following the determination of sovereignty, further technical details were to do with the construction of the single maritime boundary delimiting the two States’ continental shelves and EEZs. While the time taken to reach the Judgement following Nicaragua’s initiation of the case may appear unduly excessive to those unfamiliar with the ICJ’s proceedings, it was by no means unusual, and the technical issues were also complex. The time was necessary for all of the details of the case to be thoroughly researched and presented and then analysed by the Court. Nicaragua submitted the dispute to the ICJ to achieve two objectives: first, a ruling that it has sovereignty of various islands and cays located between Nicaragua and Colombia; and, second, the delimitation by the Court of the maritime boundary between the two States. One can see that Nicaragua wished to be granted sovereignty of certain islands in order to maximise the extent of its continental shelf and exclusive economic zone – the islands having a potentially significant influence on the extent of the resource zones that would be partially generated by them. While the case was reasonably complex at the technical level, we need only briefly state its outcome. The result was somewhat unexpected from the point of view of both parties. To start with, the Court had concluded in its Judgement on Colombia’s Preliminary Objections that it had no jurisdiction to consider Nicaragua’s claim to the islands of San Andres, Providencia and Santa Catalina because sovereignty had been determined in Colombia’s favour by the 1928 treaty. In effect, it was ruling in favour of Colombian claims to sovereignty over the islands. It also confirmed Colombian sovereignty over various other islands, including Quitesueno and Serrana. What it then went on to do was acknowledge the need, for reasons of equity, to grant no significance to Quitesueno and Serrana in relation to delimitation of the continental shelf or EEZ. While Colombia has the right to a 12 nautical mile territorial sea around these islands, it has no prospect of relying on them to generate either a continental shelf or an EEZ. The islands were effectively left as Colombian territorial enclaves within the Nicaraguan continental shelf and EEZ. While welcoming the Court’s decision over sovereignty, Colombia effectively lost the case in the final analysis because of the extensive sea area (approximately 30,000 square miles of ocean) it lost as a result of the ruling. It must be said that on first reflecting on this case, it appears to have no substantial relevance to international criminal law at all. As already explained, it was to do with rival maritime claims that, while producing tension, had not previously resulted in the parties to the dispute resorting to force. One narrow definition of ‘international criminal law’ is that implied in the Statute of the International Criminal Court (ICC), which has jurisdiction over genocide, war crimes, crimes against humanity and aggression. Unless war were to break out between the two States, it is virtually impossible to imagine circumstances in which the case would have relevance to ICC-based criminal law. Both Nicaragua and Colombia have accepted the Court’s Judgement, although the latter feels aggrieved by it. Apart from initially challenging the ICJ’s jurisdiction, Colombia has subsequently been highly critical of its ruling. Colombian president, Juan Manuel Santos, declared on 28 November that the Judgement was ‘unjust and erroneous’ and announced that his government would ‘no longer recognise the World Court in border disputes’. He went on to say, however, that Colombia’s ‘emphatic rejection’ of the resultant maritime boundary would not result in any extra-legal action; it will only rely on international legal processes to challenge it. It must be said that it is difficult to imagine what legal processes Colombia now intends to resort to. The ICJ’s Judgement is final and there is no avenue for appeal against a Court Judgement, which is legally binding on the parties. Despite post-Judgement rhetoric, Colombia has so far not acted irresponsibly in relation to it and remains within the law. On current assessment, its disappointment with the Judgement seems unlikely to cause the dispute to rumble on, and certainly not to the extent that force will be deployed (which would raise questions concerning aggression and the application of the law of armed conflict/international humanitarian law). We can reasonably hope that the dispute has been resolved peacefully and that both parties will respect that. We can also reasonably rule out the possibility of this case having any relevance to ICC-based international criminal law. If, however, we adopt a broader definition of what constitutes ‘international crime’ there is at least a suggestion that the Judgement has consequences. A broader definition arguably includes all serious crimes having a significant international dimension. Given the international nature of the oceans, crimes committed at sea will almost invariably have potentially significant international dimensions. One group of crimes with profound international consequences is to do with the manufacture, sale and trafficking of illicit narcotics. 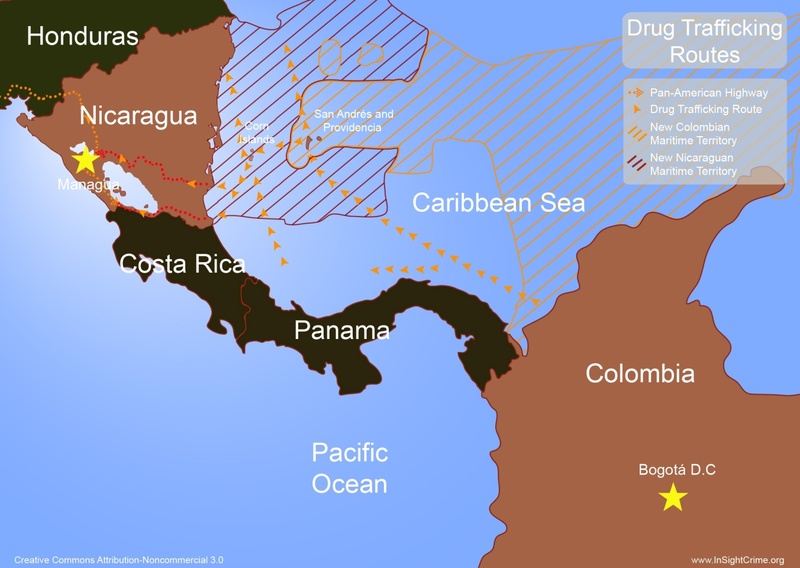 These activities are a seriously worrying feature in the Central American/Caribbean region, with Colombia itself a major source of illicit narcotics, with cartels like the Medellin, Cali and Norte del Valle extensively engaged in the production and export of drugs into North America, using maritime routes through the region. It was the narcotics problem in the region that prompted McCleskey to post her article and to ask whether the Court’s ruling would be ‘Good news for drug traffickers’. Her interjection was perhaps a little surprising, but it clearly demands some consideration, at the very least. Unfortunate Consequences for Law Enforcement? According to The Economist newspaper, in an article published on 8 December 2012, ‘Nicaragua celebrated (the Judgement) by dispatching ships to patrol its new waters. “By now [the navy has] established sovereignty in that whole territory,” said Daniel Ortega, its president’. This comment was from an article that also included the map below. That map, as well as the title of The Economist article, makes reference to Colombian (and ‘former Colombian’) ‘territorial waters’. When coupled with the quote from Daniel Ortega, in which he refers to the Nicaraguan navy having established ‘sovereignty in that whole territory’ judged by the ICJ to be within Nicaragua’s continental shelf and EEZ, an uninformed reader may gain the wholly erroneous impression that the waters in question now have the status of Nicaraguan territory. The same impression is gained from a reading of McCleskey’s article on the possibility of the Court’s ruling advantaging Colombian drug cartels and those trafficking their wares. The two articles reinforce each other’s fundamental misunderstanding of the juridical status of the waters subject to the ICJ’s Judgement. The impression that may be gained from the two articles and the manner in which they have been presented is that law enforcement activities targeting drugs traffickers in the region will be significantly affected by the Colombian navy’s inability now to operate in those waters affected by the dispute before the ICJ. This, to put if very simply and starkly, is just plain nonsense. The authors of these two articles seem to lack an adequate level of understanding of the juridical nature of the waters in question. The legal or juridical status of the waters is as continental shelf or EEZ. These are both resource zones whose legal significance is restricted to activities of an economic nature. There is absolutely nothing in the law of the sea preventing the Colombian navy operating throughout this region up to, but admittedly not within, the outer limit of the Nicaraguan territorial sea (which is a mere 12 nautical miles from the Nicaraguan coast). Maritime law enforcement operations are not affected by the range of rights and obligations contained in the 1982 UNCLOS, the instrument that is the formal source of both continental shelf and exclusive economic jurisdictions. The existence of neither continental shelf nor exclusive economic jurisdictions results in rights or obligations that significantly curtail naval operational activities. Navies do have to operate taking into account the rights of those vessels engaged in legitimate resource exploitation activities, within both jurisdictions, but the chances of navies’ obligations in this respect resulting in any serious undermining of their ability to conduct drug interdiction operations are virtually nil. The relevant parts of 1982 UNCLOS are also now widely recognised as forming a part of the customary international law of the sea and are, therefore, binding on all States – even those that are not themselves party to the convention. Colombia has the right to deploy its navy up to the limits of the Nicaraguan 12 nautical mile territorial sea and, in order to give meaning to that right, Nicaragua is under a correlative obligation not to prevent it doing so. The waters above the continental shelf and forming the EEZ are, for non-economic purposes, to be regarded still as having the status of the high seas. One of the most worrying issues within the law of the sea at present is the potential for coastal States to assume rights and to impose obligations on others that are no part of the consensus arrangements that were codified in 1982 UNCLOS. That convention was a package deal that balanced the extension and enhancement of coastal state jurisdiction with the freedom to use the high seas for navigation and other legitimate activities. The suggestion that navies should remove themselves from other States’ areas of continental shelf jurisdiction or EEZs serves profoundly to undermine that balance and the pattern of rights and correlative obligations that define zones of maritime jurisdiction. Statements, such as that made by President Ortega to the effect that the Nicaraguan navy had secured the new ‘territory’ granted to Nicaragua by the ICJ, are arguably irresponsible political rhetoric; they are arguably also deserving of some measure of challenge from other States. When respectable internationally renowned publications like The Economist fail to use the correct terminology when describing issues of this nature, there is also a need for their errors to be highlighted; if they are not they may add to the gradual spread of erroneous assumptions about vital rights and obligations at sea. This ICJ Judgement should in no substantial manner adversely affect the way in which the Colombian navy goes about its lawful business interdicting illicit narcotics traffickers in the waters of the south-western Caribbean. Indeed, there may even be some hope of enhanced cooperation in the region now that this dispute is legally settled. Both Colombia and Nicaragua have clear national interest in putting an end to this traffic through their waters – and the United States also has a major interest in supporting them both. Perhaps now that the territorial and maritime boundary dispute is resolved, a responsible diplomatic approach by the US to bring the two parties together in a spirit of cooperation will see drug interdiction improved in these waters. In resolving the dispute, the ICJ has probably done much to stabilise and normalise relations between Nicaragua and Colombia. In the long term, far from benefiting the drugs cartels, this Judgement may well serve to create the conditions for a further curtailing of their activities. Territorial and Maritime Dispute (Nicaragua v Colombia), Judgement, 19 November 2012. See www.insightcrime.org/news-briefs 20 Nov 2012. 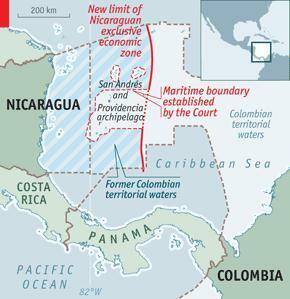 ‘An islet for a sea: Colombia smarts from a loss of territorial waters’, The Economist, 8 December 2012. A Sea Free From Piracy – When Mare Will be Really Liberum? A spot of a small boat approaching a merchant vessel crossing the Red sea or a cruise ship riding to the sunny Seychelles can be a sign of a great danger and a terrible misfortune if not noticed in time. Hugo Grotius, the Dutch philosopher, more than 400 years ago in his book “Mare Liberum” (The Free Sea) declared that it was not possible to own sea. However, soon it was realized that its treasures were not without a master. In the same 17th century Sir Edward Coke, an English jurist and Member of Parliament, expressed concern about the criminals – the pirates, who were characterized as the hostis humani generis (enemy of all mankind). The recent situation, especially in Somalia, reveals, that this problem still has an alarming tendency even in the 21st century. Indeed, nowadays, the character of a pirate is far from the one romanticized by Capt. Jack Sparrow. Usually, they are local seamen looking for a quick score, highly-trained guerrillas, rouge military units, or former seafarers recruited by crime organizations. Armed with knives, machetes, assault rifles and grenade launchers, they steal out in speedboats and fishing boats in search of supertankers, cargo ships, passenger ferries, cruise ships, and yachts, attacking them at port, on the open seas, in international waters. 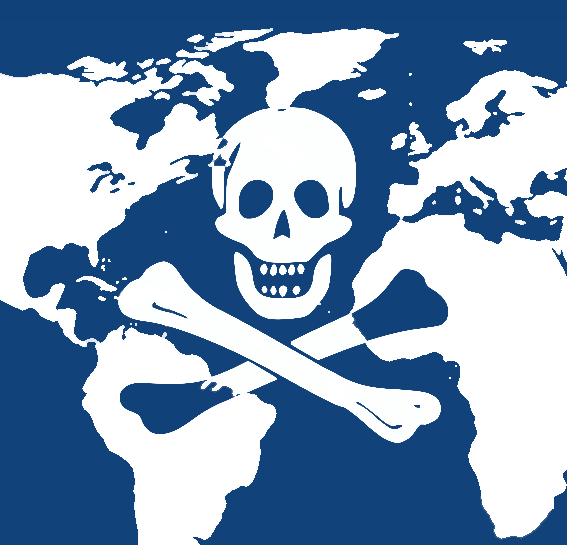 Also, the “Jolly Roger” – a famous flag of pirates, is not used by pirates themselves, but indicates a great danger in the various maps of maritime risk intelligence. The estimated figures of the International Maritime Bureau’s (IMB) Piracy Reporting Centre show, that worldwide in 2012, pirates have committed 278 attacks, hijacked 27 vessels, took more than 400 hostages, from which 147 are still held by Somali pirates. In addition, 58 attempted attacks were reported. Indeed, the drop in Somali piracy has brought global figures for piracy and armed robbery at sea down compared with 2011, when 439 worldwide piracy attacks were reported. Nonetheless, there can be no room for complacency till entire ships are hijacked and cargo crews simply vanish. Mariners are warned to be cautious and to take necessary precautionary measures, especially when transiting through the coasts of Somalia, Nigeria, Benin, South East Asia and Indonesia. As mentioned before, in Somalia attacks have dropped significantly, mostly due to the increased military action on suspected skiffs, military anti-piracy operations and increase in armed guards onboard ships. However, Somali pirates still remain the greatest global threat, as the majority of the worldwide piracy attacks are attributed to them. Usually, the tactics of the Somali pirates is to attack ships in the northern, eastern and southern coast of Somalia. According to the IMB’s report of 2011, these pirates have also attacked vessels much farther off the Somali coast. They have moved deeper into the Indian Ocean, off Seychelles and the Maldives, and further south along the East African coast, off Kenya, Madagascar, and Mozambique. To proceed with attacks very far out to sea, pirates normally use “mother vessels”, which are able to launch smaller boats to attack and hijack unsuspecting passing vessels. In the case of Nigeria all waters are considered to be risky. Pirates attack, hijack and rob vessels, kidnap crews along the coast, rivers, anchorages, ports and surrounding waters. Piracy in the Gulf of Guinea has been over shadowed by Somali piracy in recent years and is becoming increasingly dangerous (34 incidents from January to September 2012, up from 30 last year) and has pushed westward from Benin to Togo, Ivory Coast and Ghana. The recent attacks indicate a worrying development of a dangerous business in the region. Attacks in Indonesia remain a concern as well. These attacks, which are normally launched during the night, have largely taken place in the Malacca Strait, through which 30 percent of the world’s trade and half of the world’s oil shipments pass. As reported by the IMB, pirates’ attacks are often violent, planned and aimed at stealing oil, gas or other products which can be easily sold on the open market. To cover their tracks once the vessel is hijacked, they damage the communication equipment and at times even the navigation equipment. A ransom demanded for the release of the vessel and crew is also a prospective criminal deal of piracy. An estimated global cost of piracy for 2010 was in the range of $7 to $12 billion, while for 2011 $7 billion were estimated only as Somali piracy’s impact on the global economy. Piracy and armed robbery have great economic consequences, as they are disrupting the delivery of humanitarian aid, especially to Somalia, threatening vital sea lines of communication, economic interests and security of countries at risk, as well as international maritime security and commerce. As a result of these challenges, many ships have begun to hire armed guards. While this tactic can be quite effective, however, there is not yet a process for regulating these guards, creating potential legal complications. The killings of pirates by security companies, as the one of 2010 when the private security contractors shot dead a Somali pirate, raises questions over who has jurisdiction over a growing army of armed guards on merchant ships flying flags from many nations. A piracy expert Roger Middleton, from the British think tank Chatham House, cautions, that : ”there’s currently no regulation of private security on board ships, no guidelines about who is responsible in case of an attack, and no industrywide standards”. Therefore, the shipping industry and national governments should better coordinate their response to the threat of piracy. The international community has taken a number of steps to tackle piracy when it emerged as a threat to international maritime security several years ago. In 2008, the UN Security Council passed a series of measures targeting Somali piracy, including Resolution 1816, which authorized states to undertake enforcement actions against piracy and armed robbery in Somalia. Following this and other UN resolutions, NATO, European Union, and United States started naval patrols operations in the Gulf of Aden. This has improved security in that narrow body of water and pushed pirate activity into the broader Indian Ocean, making attacks more costly and risky for pirates, but also making it more difficult to counter attacks across such a vast area. Similarly, in 2011, Indonesia and Malaysia deployed two warships to the strait as part of a joint patrol targeting pirate attacks. The countries have also developed an “Eye in the Sky” operation with Singapore and Thailand, by which they jointly carry out air patrols. However, not all navies, especially in the Gulf of Guinea have the resources to fight piracy far out at sea, so criminal gangs shift to other areas. Nonetheless, despite these efforts, it is realized that piracy cannot be solved by military means alone. The amount of ocean to patrol is too vast to protect every ship and, as risk analysis shows, pirates have responded to the increased naval presence by moving attacks farther out to sea. Piracy is most often just one symptom of the general collapse of law and order in the failed state. As a result, the attacks on shipping will continue as long as there is no central government capable of taking on the well-armed and well-paid pirate gangs. Thus, tackling the root causes of piracy, supporting local communities and improving prosecution have a key importance for the rescue of the seas from pirates. The UN Convention on the Law of the Sea makes piracy a universal crime, and subjects pirates to arrest and prosecution by any nation. Taking the example of Somali’s piracy, the root of problem here has been the lack of an effective central government tied with limited economic opportunities throughout the country, where piracy became a mean of survival. In addition, Somalia is composed of a large number of clan groups, and the law is largely implemented at the local level. For many of these groups, piracy provides an economic lifeline, and so they are not willing to prosecute pirates. Indeed, pirates usually operate as a part of an organized crime network, such as JakartaGlobe in Indonesia. The warlords have intervened sending a good deal: traffickers living in Dubai or Yemen and fisherman are hired by gangs of pirates to execute criminal business. Foreign warships patrolling the area are creating some difficulties but the business is too lucrative to stop the traffickers. Thus, it is clear that, if convictions of pirates in courts will not be successful, with many pirates walking away free, the threat of going to prison will not be a credible deterrent from piracy. Furthermore, to combat piracy effectively means not only focusing on the pirates operating at sea but also changing the risk-reward equation for the ringleaders, clans providing support to pirates and agents providing intelligence from African ports. Further, it means reducing the freedom of movement pirates currently enjoy despite the private, national and international efforts. Piracy cannot also be defeated without the active cooperation of all the actors involved, including the regional governments. Pirates are well organised and resourced criminals. They rapidly adjust their tactics and manage to avoid naval patrols by operating farther offshore. Therefore, the holistic approach and the measures including military sea and land based anti-piracy action, preventive techniques used by the merchant vessels, strengthening law enforcement for the affective arrest and prosecution of pirates in the coastal countries, increasing cooperation between all counter-piracy actors and optimizing their efforts should be the priority to tackle evolving pirate trends and tactics. Equally, more significant impact should be made to eradicate the roots of piracy by building-up the capacity of the states and accelerating social and economic development. These measures in long term perspective can mitigate new developments in piracy, reduce its recent effect and contribute to the final defeat, enabling to declare that mare is liberum once more. United Nations Interregional Crime and Justice Research Institute, Freedom from Fear 3, Pirates of the XXI Century on the Treasure Hunt, April 2009, p. 31. United Nations Convention on the Law of the Sea, 10 December 1982, Article 101.
 International Chamber of Commerce, Piracy & Armed Robbery News & Figures,3 December 2012,available at: http://www.icc-ccs.org/piracy-reporting-centre/piracynewsafigures, [accessed 19 December 2012]. International Chamber of Commerce, IMB Reports Drop in Somali Piracy, but Warns Against Complacency, available at: http://www.icc-ccs.org/news/811-imb-reports-drop-in-somali-piracy-but-warns-against-complacency,[accessed 19 December 2012]. International Chamber of Commerce, Piracy & Armed Robbery Prone Areas and Warnings, available at: http://www.icc-ccs.org/piracy-reporting-centre/prone-areas-and-warnings, [accessed 18 December 2012]. International Maritime Bureau, Global Piracy Report 2011, available at: http://www.ibm.com/investor/pdf/2011_ibm_annual.pdf, [accessed 19 December 2012]. Council on Foreign Relations, Combating Maritime Piracy, available at: http://www.cfr.org/france/combating-maritime-piracy/p18376,[accessed 18 December 2012]. One Earth Future, The Economic Cost of Maritime Piracy, Working Paper, December 2010, available at: http://www.cfr.org/france/combating-maritime-piracy/p18376, [accessed 18 December 2012]. World, Private Guards Kill Somali Pirate For First Time, 24 March 2010, available at: http://www.huffingtonpost.com/2010/03/24/private-guards-kill-somal_n_511143.html, [accessed 19 December 2012]. Council on Foreign Relations, Smarter Measures in Fight Against Piracy, 10 December 2010, available at: http://www.cfr.org/somalia/smarter-measures-fight-against-piracy/p23611, [accessed 19 December 2012]. Supra note 1, p. 13. Sea Piracy – a not very talked about subject and also not understood well because it doesn’t directly affect the daily lives of most people. But it is a major concern for shippers, insurance agencies, underwriters, crews and cargo owners and it does ultimately affect all consumers because it can drive up the price of goods, including oil, other commodities and manufactured products. In a way, shipping companies have pretty much been on their own to cope with piracy. Then national navies took up the cause, with loosely coordinated patrols to waive off pirates. This cooperation was enhance by reporting mechanisms and armed guards on ships. Then armed guards came on commercial vessels. Most guards are from private maritime security companies, and some came from host militaries. [i] This issue of confused safety regime came much into light in February 2012, when the Italian Marines based on the tanker Enrica Rexie allegedly fired on an Indian fishing trawler off Kerala, India killing two of her eleven crew. The Marines allegedly mistook the fishing vessel as a pirate vessel. The incident sparked a diplomatic row between India and Italy. [ii] Enrica Rexie was ordered into Kochi where her crew were questioned by officers of the Indian Police. Given the increasing incidence of piracy, including within India’s Exclusive Economic Zone, and the increasing number of pirates apprehended by the Indian Naval forces, a need was felt for a domestic legislation on piracy which could provide the necessary legal framework within the country for prosecution of persons for piracy related crimes and in response the Piracy Bill 2012 has been laid. [v] India is not the only country grappling with the intricacies of law dealing with piracy and therefore, the bill might be of some help to other countries in need of it. Definition of Piracy is verbatim from the United Nations Convention on the Law of the Sea, 1982. Punishment: An act of piracy is punishable with imprisonment for life except where the accused has caused death in committing the act of piracy or attempt thereof in which case he may be punished with death and in addition the Designated Court may also subject to any restitution or forfeiture of property involved in the commission of the offence. On one hand, there is a demand for abolishing death penalties at all forums, including death as a punishment might not be taken well by the international community at large. An attempt to commit piracy or any unlawful attempt intended to aid, abet, counsel or procure for the commission of an offence of piracy shall also constitute an offence and is liable on conviction to be punished with imprisonment for a term which may extend to fourteen years and shall also be liable to fine. In addition, an accomplice to an act of piracy shall be liable on conviction to be punished with imprisonment for a term which may extend to fourteen years and shall also be liable to fine. Extradition and Reciprocity: The offence shall be deemed to have been included as extraditable offences and provided for in all extraditable treaties made by India. In the absence of a bilateral extradition treaty, the offences under this Act shall be extraditable offences between India and other Convention States on the basis of reciprocity. What is interesting here is that for the purposes of application of the provisions of the Extradition Act, 1962 to the offences under this Act, any ship registered in a Convention State shall, at any time while that ship is plying, be deemed to be within the jurisdiction of that Convention State whether or not it is for the time being also within the jurisdiction of any other country. Extension to Exclusive economic Zones: It is also for the first time that the Indian jurisprudence is being extended beyond the territorial waters with particular reference to the Exclusive Economic Zone(EEZ) of India. This might raise some debate since the contiguous zones and EEZ for all practical purposes are considered as high seas except for certain environmental, fiscal related purposes and for the use of maritime resources by the coastal state. On the high seas, or in any other place outside the jurisdiction of any State, every State may seize a pirate ship or aircraft, or a ship or aircraft taken by piracy and under the control of pirates, and arrest the persons and seize the property on board. A seizure on account of piracy may be carried out only by warships or military aircraft, or other ships or aircraft clearly marked and identifiable as being on government service and authorised to that effect. It is critical therefore, that a solid international legal framework regulating the use of PMSCs and their ROEs is developed. A strong law, is definitely needed to avoid the ambiguities yet as the challenge is clearly beyond the capability of national navies alone, collaboration with the shippers is essential to getting control of this problem. Lacking international agreement to address the problem could, in the worst cases, lead to conflict. While things remained quiet with regards to the interpretation of sea piracy laws in the US, the decision in US v. Said disturbed the status quo waters. A federal judge dismissed the charge of piracy at the pre-trial stage, interpreting piracy to narrowly mean a “robbery at sea.” The prosecutor filed an interlocutory appeal, and the Appeals Court remanded the case for proceedings to be consistent with US v. Dire. In US v. Dire, the defendants, a group of Somali pirates, approached a vessel assuming it was an unarmed merchant vessel. Dire and two other defendants on the skiff were armed and began shooting at the vessel, which was actually the USS Nicholas on an anti-piracy mission. The defendants attempted to flee after the crew of the Nicholas returned fire, but were caught before reconnecting with its mothership. There were two more defendants aboard the mothership who were also apprehended. During questioning the defendants each separately confessed the scheme to hijack the vessel. The defendants on appeal asserted that their attack did not amount to piracy under USC 1651 because it was not a “robbery at sea.” In summary, the Appeals Court disagreed and found that USC 1651 “incorporates a definition of piracy that changes with advancements of the laws of nations.” Further, piracy under the law of nations encompasses the violent conduct of the defendants. The Dire decision should allow the Said court to reconcile its decision in light of the analysis made in Dire. This should make the laws in the US consistent with regards to the interpretation of what piracy constitutes. In the EU, Italy has also begun national prosecutions of pirates. The newest piracy cases to emerge in Italy are the Montecristo Hijack trials and the Valdarno. In October 2011, the Montecristo, an Italian cargo ship carrying scrap metal, was attacked by Somali pirates. The crew “sealed” themselves off in the citadel room. The crew continued to watch the pirates attack the ship with RPG’s from the citadel. The pirates boarded the Montecristo. When a helicopter was heard outside, the crew fired flares and flashed SOS signs to indicate they needed help. They were rescued by British and US warships who then arrested the pirates onboard the Montecristo. The pirates were brought to Italy for trial and were charged with “attempted hijacking” among other charges. The Somali pirates were convicted and sentenced between 16 to 19 years. In Valdarno, the pirates were not able to board the vessel, but attempted to stop the vessel by firing at it. They were apprehended by the Italian military on board a Yemeni ship, thus making one of the critical issues whether Italy had proper jurisdiction. This issue was not flushed out in litigation because the defendants accepted plea deals. All of these cases point to a possible increase in national prosecutions of piracy cases. These cases indicate that the emerging jurisprudence seems to be consistent with international norms and that countries are willing to prosecute these criminals. This should come as good news to the Kenya Piracy Court which claimed in 2010 that it would “stop prosecuting piracy cases” unless other countries were willing to “share the burden.” The importance of the Kenya Court should be emphasized. The cases prosecuted by Kenya have been used in decisions such as Dire to further illustrate what the legal norms and the exact contours of piracy are. In light of these cases, perhaps one important discussion the international community should take the time to have is what kind of sentences and plea offers should be acceptable in piracy cases. While each case will have a different set of facts, the trends in litigation indicate that challenges to jurisdiction are extremely common. If sentences are similar it would prevent defendants from “forum shopping.” All the defendants in the cases discussed so far are from Somalia. Many of them are motivated to engage in this behavior because of the lack of opportunities and the quick availability of funds. It is important that during sentencing national judges also consider incorporating educational and opportunities for rehabilitation (if needed) if they exist within the prison system. Otherwise, once the pirates have served their sentences, they will return to venture out to the high seas for work again. These were the facts presented at the trial of the defendants. US v. Dire, No. 11-4310, 4th Circuit Court of Appeals, May 23, 2012, 5. Maritime piracy is a growing global issue today. Eugene Kontorovich of the Northwestern University Law School has characterized modern piracy as an “epidemic.” Until two decades ago, piracy was not seen any more as a menace to international shipping. It has unfortunately come back to haunt us, this time not as the pirates of days past but equally in a very violent way, using modern means and methods to the extent that it has become today a major source of concern for crews, ship-owners, insurers, coastal communities and concerned international organizations. The new face of this historic crime exacts worldwide human and financial costs, and poses an existential challenge to the piracy laws developed throughout the centuries. As with ancient civilizations fighting for survival against the pirate scourge, the proliferation of piracy today poses drastic economic and security threats to many nations. Piracy today includes new tactics employed to carry out a crime predating recorded history. Speedboats and automatic rifles, rather than frigates and swords, recently became the pirate’s weapons of choice. While looting cargo or stealing ships outright remain standard practice, Somali pirates today also kidnap sailors for ransom. The modern pirate is different from his historical counterpart in many ways. Modern pirates have adapted to the globalized world in terms technical, political, economic, and social developments. In truth, “today’s pirates are considerably more sophisticated than their counterparts of yesteryear.” Today’s pirates make use of the modern technologies that are available to them. They strategically plan each attack with the help of publicly available information about their target. They “often carry satellite phones, global positioning systems, automatic weapons, [and] antitank missiles.” Some pirates now hijack “mother ships,” which they use as bases from which to launch attacks against other vessels up to more than 1,000 miles from shore using “rocket-propelled grenade[s], ladders and extra barrels of fuel.” The use of modern methods and technology has shifted the character of piracy making them precise and effective operations rather than acts which happen by chance. Therefore, the new face of piracy requires more modern means for combating it. The shipping industry has long been considered one of the most dangerous in the world. Recently, however, piracy has risen up in the list of menaces faced by seamen. According to the January 31, 2012 figures of the worldwide piracy center of the International Maritime Bureau (IMB), Somali pirates are currently holding captive 10 vessels and 159 hostages. One hundred and two incidents of piracy and armed robbery have been reported to the IMB Piracy Reporting Centre (PRC) in the first quarter of 2012. Eleven vessels were hijacked with 212 crew members taken hostage and four crew killed. A further 45 vessels were boarded, with 32 attempted attacks and 14 vessels fired upon – the latter all attributed to either Somali or Nigerian pirates. These pirates have a great effect on the world economy and trade. Hundreds of seafarers have been held hostage and forced to suffer physical and mental ill-treatment. The Philippine Coast Guard has said that for the last few years, there were already 5,000 ships worldwide attacked by pirates and more than 1,000 seafarers, including Filipinos, have been taken as hostages, or used as human shields against rescuing government and military forces. This is a very serious problem, and more so for a country like the Philippines. The Philippines, an archipelago, relies heavily on the shipping industry. The Maritime Industry Authority (MARINA) of the Philippines said the country has 140 ships on the international register, and about 90 percent of these ships pass through the pirate hotspots of the Indian Ocean, Gulf of Somalia and Aden. Another facet of the issue pertains to the deployment a large number of Filipino seamen in the worldwide maritime industry. Figures from the Philippine Overseas Employment Administration show that in 2010, the Philippines deployed 347,000 shipboard personnel, around 5.06 percent higher than in 2009. Despite the increasing risks of piracy, there does not seem to be any shortage of Filipinos wanting to apply for a job in the maritime industry. Based on the projections of the Philippine manning industry, a record number of 400,000 Filipino seafarers will have been deployed worldwide by the end of 2011 despite the crisis in Europe. This large amount of Filipino seamen deployed can be explained from an economic standpoint. Filipino seafarers, who are better paid than other overseas Filipino workers, send higher than average remittances. In 2007, seafarers sent home $2.2 billion, about 15 percent of the $14.5-billion total remittances from Filipino workers overseas. That is comparatively huge since they make up only three percent of the 8.7 million Filipinos working and living abroad. MARINA said with the Filipino seafarers raking in more than US$3.8 billion in revenue for the country in 2010 and more this year, the threats of piracy need urgent interventions from stakeholders. Filipino seafarers, comprising one-third of the world’s seafarers or numbering some 300,000, are among the most exposed to risks in the shipping world. With the Philippines providing a large number of seafarers in the world, their vulnerability to piracy is high.A third of all the world’s seafarers are from the Philippines, so it is not surprising that there is another less welcome statistic – in the past year, more Filipinos have been taken hostage than any other nationality. The statistics prove to be staggering and grim. One Filipino shipping crewmember has been taken hostage every six hours somewhere in the world, according to an official running count by the Department of Foreign Affairs (DFA) of the Philippines. Every time there’s a report of a ship hijacked off the coast of Somalia, almost always there’s a Filipino involved. Since 2006 470 Filipinos have died at the hands of pirates.Out of some 400,000 Filipino seafarers, who make up a quarter of the world’s seagoing workforce, 769 were captured between 2006 and 2011. Filipinos are not being particularly singled out by the pirates, it is just that so many people from the Philippines work in the maritime industry. It is because of this that the Philippines has a great interest in ensuring the safety of its seamen and in the measures, both legal and remedial, for preventing and prosecuting piracy. Piracy significantly affects modern day society as it causes great damage and loss to world trade and economy. Pirates have acted boldly and without fear as they take advantage of the state’s and international community’s inaction. With many of the world’s goods, especially necessities like oil and fuel, passing through sea lanes, the threat of piracy simply cannot be ignored. It persists as a modern day menace due to a number of factors, primary of which is the difficulty to catch pirates as they can easily escape detection and capture in the vast oceans of the world. Many countries, even the big naval powers, do not have the resources to constantly monitor every square mile of water. Ultimately from the practical point of view piracy will be lessened if there is greater political will to stop it and if there is better coordination and cooperation between states that are affected by it. But that is only one aspect of the problem. Effective laws and procedures, and their strict enforcement, will go a long way in eradicating piracy. But as it is, the existing legal framework proves to be an insufficient mechanism to alleviate the problem. International laws and treaties have not been fully implemented and are too fragmented. Also, while piracy is covered by universal jurisdiction, there is a seeming lack of cases prosecuted, as states have found it to be too burdensome to proceed with cases which entail additional cost and effort on the part of those who have apprehended or are in custody of pirates. There must be a concerted attempt on the part of states to improve the existing legal framework on piracy as well as ensure that these improved laws are enforced. The establishment of an international tribunal on piracy will be a very important stride as this will provide a proper venue where affected parties will be able to seek redress. No longer must pirates be able to roam the seas with impunity and evade the long arms of the law. They must be brought before the courts of law, and justice must be meted out against them so that they will realize that they are not above the law. And having such a tribunal will show to modern pirates that the international community is united and is serious is combating piracy. Pirates plagued the coasts of ancient Greece. Sandholtz & Stiles, supra note 3, at 32; Jesus, supra note 3, at 364. Joshua Michael Goodwin, Note, Universal Jurisdiction and the Pirate: Time for an Old Couple to Part, 39 Vand. J. Transnaional. L. 973, 982 (2006). Jeffrey Gettleman, Pirates Tell Their Side: They Want Only Money, N.Y. TIMES, Oct. 1, 2008, at A1, available at 2008 WLNR 18637664. Michael H. Passman, Protections Afforded to Captured Pirates Under the Law of War and International Law, 33 Tul. Mar. L. J. 1, 6 (2008). Jack A. Gottschalk et al., Jolly Roger with an uzi: The rise and threat of modern piracy 22 (U.S. Naval Institute Press, 2000). See the International Chamber of Commerce’s Commercial Crime Service website, which maintains a section on Piracy Prone Areas and Warnings, and which is available at http://www.iccccs. org/home/piracy-reporting-centre/prone-areas-and-warnings. As of April 2010, the website warned that Somalis hijack ocean going fishing vessels for piracy operations, using these as mother ships from which to launch smaller boats to attack other vessels. Every 6 hours, pirates seize a Filipino seaman http://pcij.org/stories/every-6-hours-pirates-seize-a-filipino-seaman/, (last visited June 28, 2012). Threats of piracy beset maritime industry, Filipino seafarers http://www.filipinosabroad.com/ofw-news/threats-piracy-beset-maritime-industry-filipino-seafarers.html, (last visited June 28, 2012). Anti-piracy group: In last 5 years, 65 seafarers died of torture, disease http://www.filipinosabroad.com/ofw-news/anti-piracy-group-5-years-65-seafarers-died-torture-disease.html, (last visited June 28, 2012). Somali piracy takes heavy toll on Philippine sailors, http://www.bbc.co.uk/news/world-asia-pacific-15259042, (last visited June 28, 2012).